July | 2014 | BES Drongos | Follow that monkey! BES Drongos | Follow that monkey! Hello everyone! The Drongos have had their first guiding for our expanding flock! Due to stormy weather, our guiding session was pushed back for half an hour. Because we started a bit late, we did not manage to see as many animals as we did previously. However, it was still a very fruitful session with the flock picking up many new and fascinating stories about the trail! Jac, the ponytailed one in blue, was our official guide. 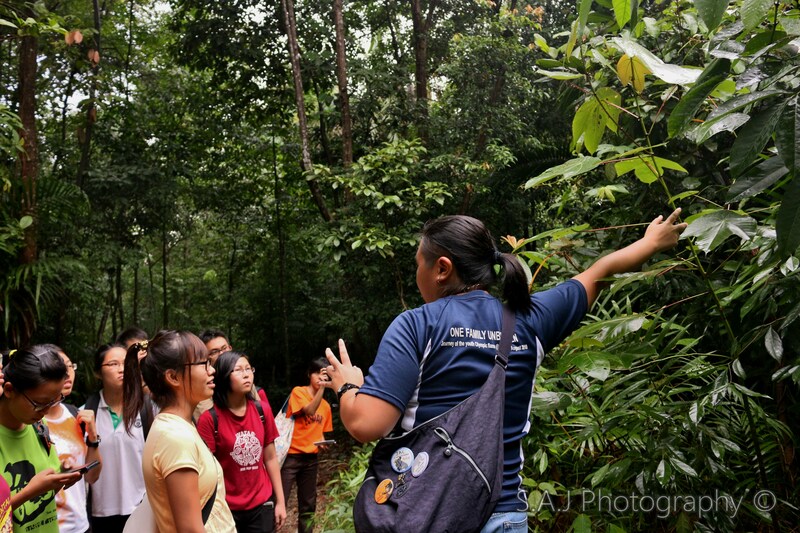 Though hoarse from all her work in the zoo, she was enthusiastic and incredibly knowledgeable throughout the trail! 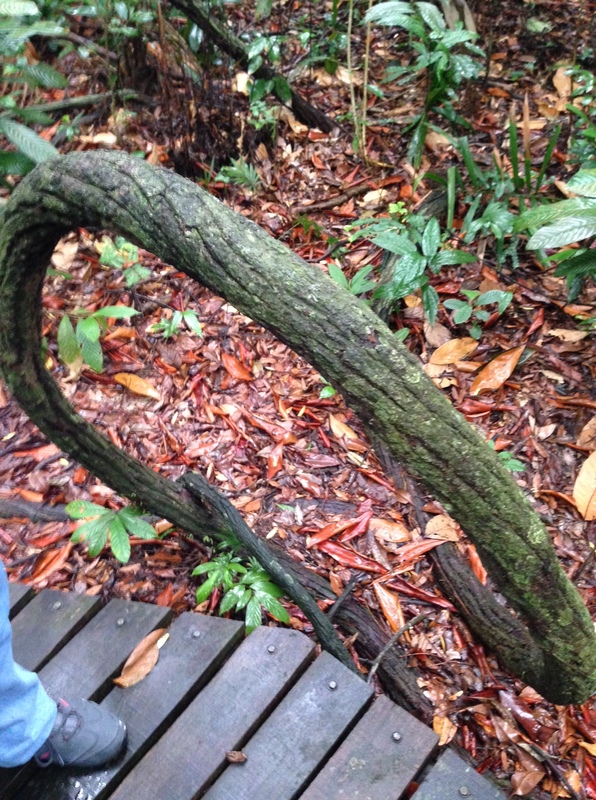 These thick, woody Lianas can commonly be seen weaving through the gaps of trees. They are commonly referred to as Tarzan’s vines as you can very well imagine him swinging through the forest using one of these. OOOAAAOOOOO! 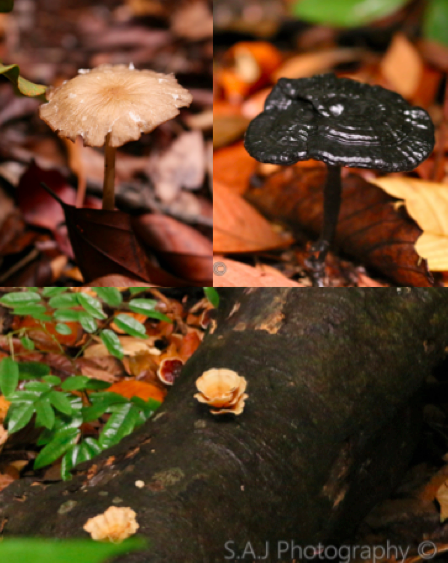 The recent wet spell seems to have resulted in a great mushroom boom, and we certainly saw a pretty big variety today! They sprouted almost everywhere: from amongst the leaf litter to rotting logs. We are not quite sure what the exact species of these shrooms are but it is better to not to pick or eat any mushrooms growing in the wild. Some mushrooms can be very poisonous (even if they look pretty familiar or tasty), so try not to eat and random mushrooms you find outside your supermarket! 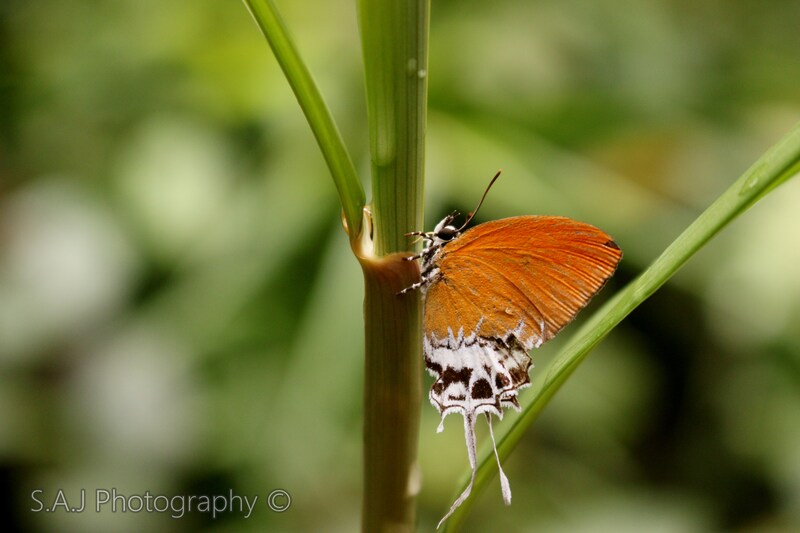 This Branded Imperial Butterfly (Eooxylides tharis distanti) was spotted perching picturesquely on the stem, allowing for this wonderful shot. It is a rather common sight and can be seen in gardens and parks all around Singapore. This Hairy Clidemia (Clidemia hirta)might be a common sight along the roads of Singapore but did you know that it is an alien species? It actually originates from the American Neotropics (Mexico to Paraguay) and has invaded three continents including Africa! Its nickname, Koster’s Curse, is well-founded as it is known to grow in dense thickets and smother hence outcompeting native vegetation. 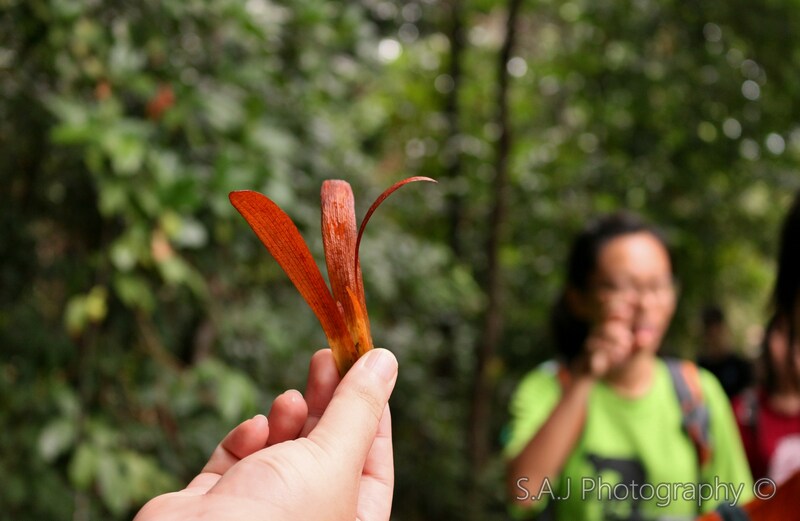 This winged fruit is from a Diterocarp (Greek for two-winged fruit)tree, likely belonging to the Seraya genus. It’s three wings help disperse the fruits so that it would not compete with the parent tree for resources such as water and sunlight. It was great fun watching these fruits spinning down like helicopters! Moreover, these tall trees are known to be keystone species, it’s effects far outweighs its abundance, serving as a home for mammals and providing food for them. Isn’t it cool how such little seeds are so important? 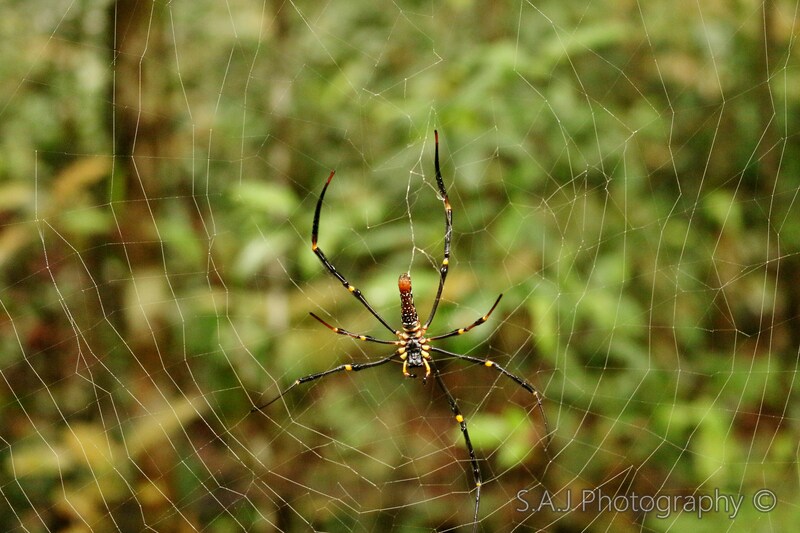 A Golden silk orb-weaver (Nephila pilipes) was seen hanging by sidewalk, a common sight in most nature reserves in Singapore. Surprisingly, the Golden within the name does not refer the bright yellow strips on the spider but how some threads in their web glimmer like gold in sunlight. 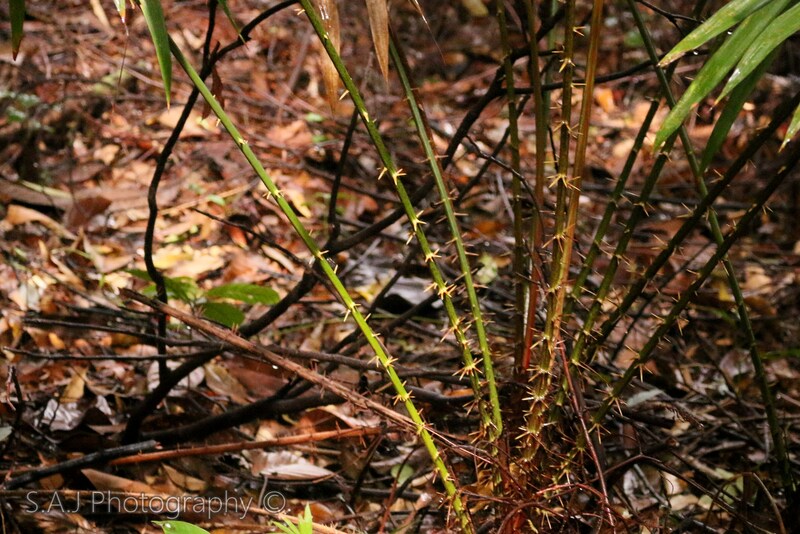 The Rattan (Myrialepis paradox) looks forbidding with its spiky bark but more people are familiar with it when the spikes are gone. 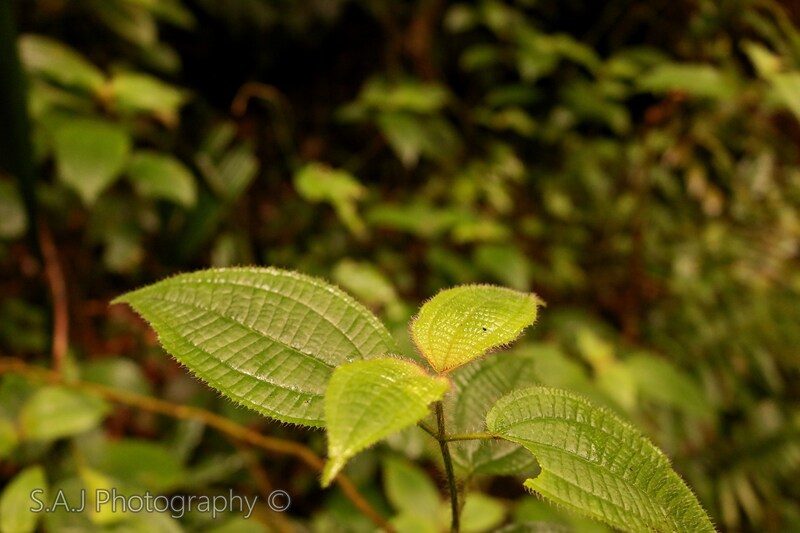 After all, it is from this plant when our parents commonly get their canes from! This Halictidae (Nomia sp.) or more commonly known as Sweat Bee, seems intent on gathering nectar from this Sendudok (Melastoma malabathricum). Its nickname is apt as these bees are known to be attracted to perspiration. It was a fun, informative and wet session spent together with the flock! Do look out for our next exploits with our new flock and hopefully more sightings of animals! The EIA is now online! The BES Drongos adventures on the Petai Trail and more! What are the millennials up to lately?